I took this picture last February at Swan Lake. Currently, my best guess is that this is a hybrid gull, possibly Glaucous-winged x American Herring Gull, or a somewhat odd (to my eyes) Thayer’s Gull. I eliminate pure Glaucous-winged Gull because of the very dark on the primaries. I eliminate pure Herring Gull due to the dark eyes and not-black on the primaries. I’m not sure that I can really eliminate Thayer’s Gull, though neither am I convinced it is a Thayer’s Gull. This may be due primarily to my inadequate understanding of the range of variation in Thayer’s Gulls, however. The orbital ring of this bird seems to be almost a mix of yellow and pink, suggesting the possibility of a hybrid, as Thayer’s Gulls should have a pink to pinkish-purple orbital ring. This bird also seems to be a little bit bulky for a Thayer’s Gull, though unfortunately I neglected to take a picture that included other, more easily identified, gulls for comparison. There is a skirt, which Thayer’s Gulls can show, but it’s more typical of Glaucous-winged Gulls. Also, the dark on the wing-tips seems a bit light for most Thayer’s Gulls. If there are other characters I am neglecting to consider that would help with the identification of this gull, I would be interested in learning about them. I saw this gull the same day as the one considered above. 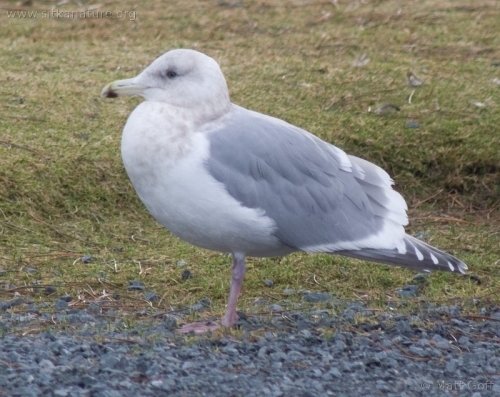 It also seems to suggest the possibility of a hybrid Glaucous-winged x American Herring Gull. 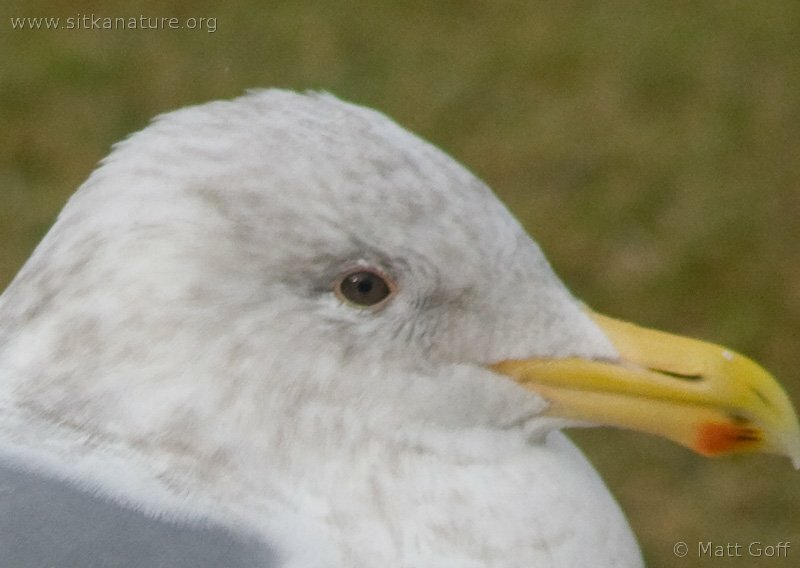 Though it looks more or less like a third-cycle Glaucous-winged Gull, the eye is unusually pale, and the wingtips are a bit dark for a pure Glaucous-winged Gull. This entry was posted in birds, identification and tagged Gulls, identification, Swan Lake. Bookmark the permalink. 3 Responses to Hybrid Gulls? I took a look at Olsen & Larsson. They report that Glaucous-winged do hybridize with American Herring, and have a nice set of photos at p. 163. It looks like in the hybrids, the white spots are on P9 and P10. Your birds show the classic 4-5 white spots at P5-P9. The grey tail, to my eye, is at the limit of Glaucous-winged, but not across it. Winter GWGUs, in particular, can have slightly darker tails. Bird 1 (photos 1 and 2): The eye color in photos 1 and 2 is typical GWGU, darker tail than bird 2/photo 3, but I’d put it at Kodak Grey Scale 7-8. Faded pink-red eye ring. Bird 2 (photo 3): Tail is Kodak Grey Scale 6-7, well within range for GWGU. Eye paler, but GWGU eyes can be tawny or olive. I think we can eliminate Thayers; the bill is too short and heavy. These are certainly hybrids; GWGU x HERG or possibly GWGU x WEGU. As pointed out, bill size, body structure, and the muddy wash of gray in the primary tips confidently eliminates Thayer’s Gull. Definitely a hybrid. 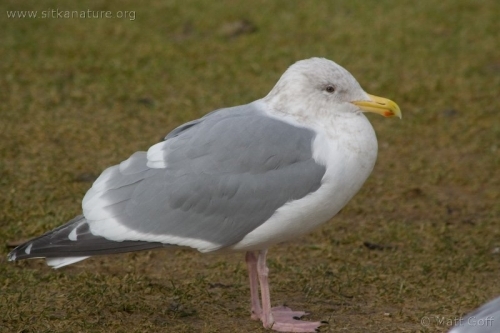 Slate gray wing tips in gulls usually indicate some hybrid origin. The bird appears quite bulky and the tertail crescent is very pronounced. The mantel is rather darkish, about that of a paler California Gull. My guess is a Glaucous-Winged Gull X Western Gull. A GWGU X HEGU would generally be paler on the mantel. This bird appears to have a rather round head as well. Many GWGU X WEGU hybrids often have shallow, flat, sloping, almost Caspian Gull like head shapes , unlike either of the parent species. This trait is highly variable however. This bill, while appearing small, seems rather stout and blunt tipped.